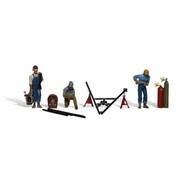 This is a Set of HO Scale Welders & Accessories from Woodland Scenics. tanks, jackstands, and the material they are welding. One Set of HO Scale Welders & Accessories.